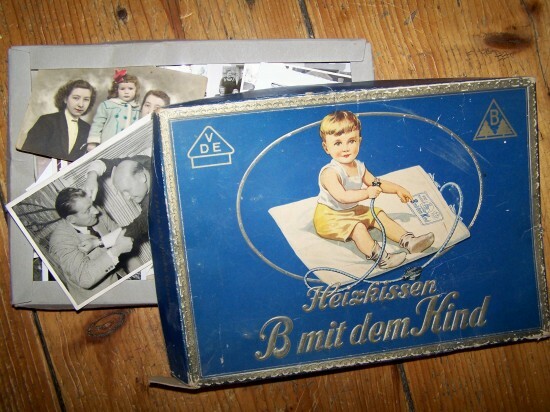 As a total sucker of old photographs I was very excited to find an old dusty paperbox with pics in the house of my husbands grandpa. There was a lot of interesting stuff in it, but this photo caught my eye in particular. 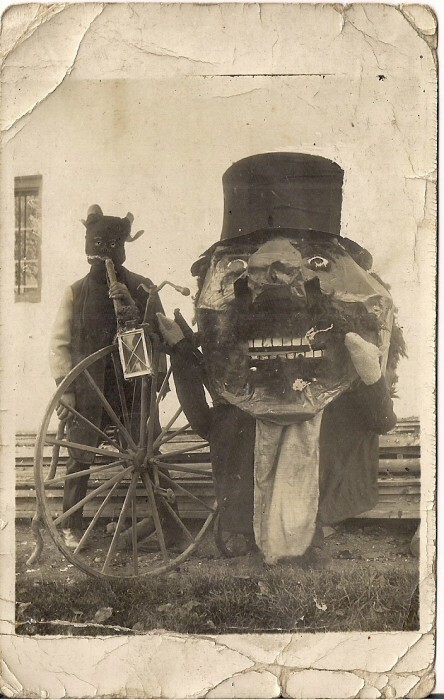 Our grandpa couldn´t tell who that is and for what reason they wore those quirky and kind of scary costumes, but I thought it´s a great find and worth to share! Wow! Who/what could they have been dressed as? Love both of the faces. Did the photo come out of that blue album? I have TONS of old family pics and many of them are absolutely gorgeous. My father has a twinbrother and they were and still are both passionate photographers. The twin-pics from the 50´s and 60´s are treasures, taken in strange vehicles, in clubs in Hamburg and Stuttgart and Venice/Italy too, always equally and very fashionable dressed in knickerbockers or glen plaid suits. We live in germany/bavaria and most likely this was were the pic was taken, Bill. Definately know one knows Mardi Gras here, specially not this generation and not in this area. I was rather thinking of some circus that was around or maybe it was taken at a “Perchten Dance”. The Perchten Dance (Original “Perchtentanz”) is a tradition in early spring here to scare the winter away. People ususally wear other kind of costumes here, more looking like bears with huge goat heads (It´s a bit freaky, I know, lol). But after I don´t see any snow in this pic I´m not sure about it! This photo was the only one in the box that´s so remarkable though. Many World War 2 pics.. But two other photos show my husbands grandma in a geisha costume on a party. And a few funny bavarian leather pants shots were in the box too.